Figure 1: rapifleX MPP completes the analyses of a 1,536 mtp in less than 8 minutes and is also compatible with a 6,144 mtp. Ultra-high throughput screening today is primarily performed by fluorescence techniques, which require labeled compounds. Mass spectrometry offers label-free screening, and inherently reduces or avoids false positives, making expensive and time-consuming hit qualification redundant. However, for large screening campaigns of millions of samples, mass spectrometry so far could not offer the required speed and robustness. 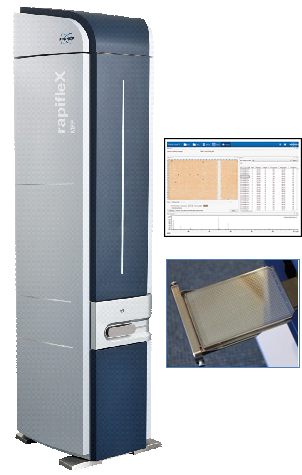 The new rapifleX MPP solution is the first robust, ultra-high throughput mass spectrometer which offers the speed, specificity and robustness of mass spectrometry for large primary screens. As a dedicated uHTS solution to accelerate drug discovery, the rapifleX MPP provides numerous advantages over traditional technologies. Its label-free detection of substrates and products accelerates assay development, reduces complexity of screening, and avoids artifacts from interferences with the labels used in traditional uHTS technologies. Adam Hill, Ph.D., Founder and Chief Scientific Officer of Prospective Research, Inc. in Cambridge, Massachusetts, stated: “The MALDI PharmaPulse solution has demonstrated impact on drug discovery today, by providing a robust, label free, multiplex capable solution at high throughput. The introduction of rapifleX is an important extension, bringing MALDI PharmaPulse to ultra-high throughput speeds and increasing the robustness of the platform for large screens." Compared to existing LC/SPE-MS HTS solutions, the rapiflex MPP is 100-1000x faster and uses about 100x less solvent, without the need for LC columns and other LC consumables. Based on Bruker’s proprietary new 10 kHz smartbeam® 3D laser system developed for the rapifleX, and incorporating a new integrated microtitre plate (mtp) sample changer and HTS automation solutions (e.g. robotics and automation software from HighRes Biosolutions, Woburn, MA), this is the first mass-spectrometry based, label-free uHTS solution, using standard 1,536 mtps, or even the latest 6,144 mtps. The rapifleX MPP completes the analyses of a 1,536 mtp in less than 8 minutes, and due to its extreme robustness is ideally suited for primary screens of millions of compounds, with significantly lower cost per sample and unprecedented primary screen ‘true hit’ rates.